While far from being the sole truth, we live in a capitalist world where money acts as a great facilitator. The way funds are raised for global causes has changed dramatically in the past twenty years with large charities using direct debits, carefully coordinated teams of street funders and call centres full of staff members, working for multiple charities, to try and convince you that their cause will benefit the most from your money. Grassroots organisations and individuals have benefited from the advent of online campaigning and donating, slashing the costs and time that is needed to raise awareness. We live in an age which makes fundraising something anyone and everyone can take part in. During the period that the Scottish Committee of the Anti-Apartheid Movement were fundraising everything took time, preparation and the efforts of many people. 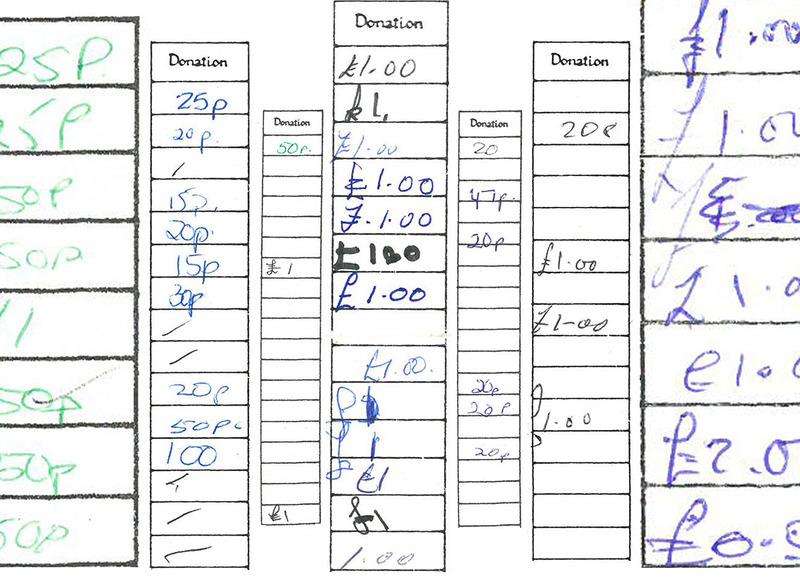 From sponsorship forms and petitions with donation columns – being made by the London or Scottish groups, sent out, photocopied, distributed and collected back in – to permissions being sought from local councils to hold flag days (raising money with collection tins in the city centre). The work that was put in was incredible compared to what can now be done at the click of a few buttons. Money was raised through events, donations, affiliations, collections and more. One of the most organised parts of the collection when it first arrived were the piles and piles of donation forms. Whereas we are now encouraged to give a set amount of money every month, and often deal with feelings of guilt or shame when we don’t have the money we feel we are expected to give – a great source of controversy of late – these forms show that people just gave what they could and were proud to be able to give something. From a few pounds to a few pence, everything and anything made a difference. Most shop tills still have collection cans sitting at the register, putting the few pence change you get into the can will not only help a good cause but you will hardly notice the difference; and if you do this every time, or every second time, at the end of the year you will have given a substantial amount to good causes without feeling the pinch. If in any doubt, stop on the way out of the shop or supermarket and look at the notice boards that are so easy to walk by, pinned to them will be countless letters from causes local and international thanking shoppers for the kind donation of whatever amount of money has been, almost unconsciously, raised.